I was talking to a friend a couple of weeks ago, and he told me a story that made me laugh. He has two middle school children who were lamenting the end of their summer vacation. He began to hum the Andy Williams song It’s the Most Wonderful Time of the Year which his children immediately pointed out was a Christmas song. He shook his head, grabbed his iPad, and pulled up the 1996 TV commercial from Staples on YouTube. If you don’t remember it, it’s the one where the father is dancing through the aisles to that song and tossing school supplies into his cart while two very unhappy children trail behind him. What can I say, my friend has a dark sense of humor. 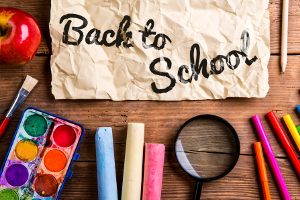 However, it is that time of the year for kids to resume their regular school routines. And while you might not be dancing around, it is a good time to think about getting your carpets cleaned for a couple of reasons. First, with the kids out of the house during the day, the timing is perfect for professional carpet cleaning. We move all the furniture (that can be moved safely and within reason) and vacuum edge to edge around the baseboards. We then clean your carpet and upholstery with safe, effective products with special attention given to pet stains, food spots, and heavily soiled areas. Finally, we move furniture back in place and place it on pads or blocks. Second, as hard as it is to say, the holidays are just around the corner. How many times have you straightened the house for a party, looked at your carpet, and wondered if you still had time to get it cleaned? Not only does getting professional carpet cleaning now check an item off your “to do” list early, but we apply DuPont Teflon to help repel liquid spills, dust, and dirt. This protection not only helps to keep your carpet clean heading into the holidays but adds a layer of peace of mind when the inevitable holiday spills happen. As a reminder, we use the hot water extraction method which is recommended by top carpet manufacturers. Our commitment to service, state-of-the-art equipment, environmentally safe supplies, and A+ BBB Rating mean you can trust Extra Effort Carpet & Upholstery Cleaning to deliver superior results. Finally, with a Flash Flood Watch in Southwestern Ohio this weekend, please be safe. Now’s a good time to test your sump pump (if you have one). The Sump & Sewage Pump Manufacturers Association has a good brochure with tips. The first step is to remove any dirt and debris from the pit surrounding the pump. Cleaning reduces wear and increases efficiency, which will help your pump last longer. The second step is to simply pour in enough water to cycle the pump on to make sure it works. 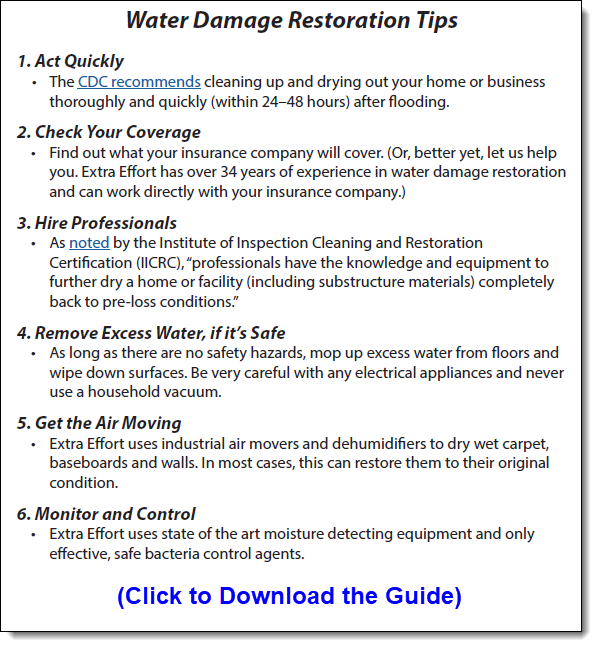 And for those that like to be prepared, to the right is our printer-friendly guide covering the key steps for water damage restoration. Questions? I am always available to answer your stain removal questions and concerns. Call us today at (513) 777-8770 to learn more about our carpet and upholstery cleaning services. Or email us at service@extra-effort.com to learn about this month’s cleaning special. Extra Effort Carpet & Upholstery Cleaning, Inc.
Elliott Fishman, along with his son Brian, is the owner and operator of Extra Effort Carpet & Upholstery Cleaning, Inc. We serve the residents and businesses of Greater Cincinnati to include West Chester, Mason, Maineville, Loveland, Wyoming, Fairfield, Indian Hill, Montgomery, Hyde Park and Anderson Township. Elliott started this company in 1984, based on the belief that it takes Extra Effort to make each job a success. The father/son team puts the extra time, extra care, and extra effort go into every task they undertake – no matter how large or small the job. Extra Effort’s quality equipment, trained technicians and safe products have made the company a top choice for residential and commercial carpet cleaning, upholstery cleaning, water damage / water extraction, fabric protection, odor control and spot removal.